The beaches in and around Khao Lak are simply stunning and not busy like the beaches in Phuket. For this reason Khao Lak is still a relatively unknown and remains a small gem of paradise that you must visit before the hoards of tourists discover it. 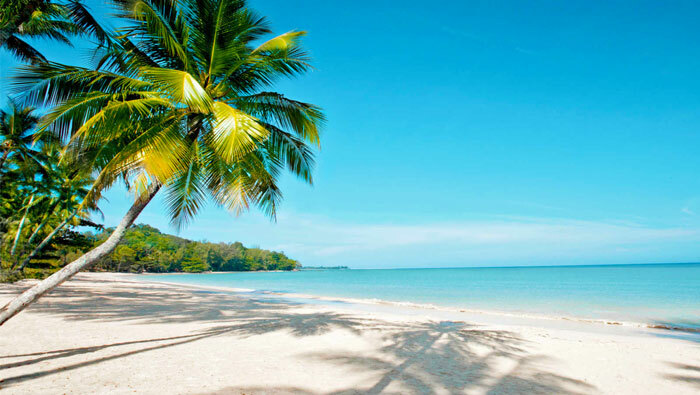 Below we list our favorite beaches in Khao Lak. The list is by no means complete but just serves to give you a taste of what to expect in this part of Thailand. On Saturday mornings Rawai Muay Thai students train on the beach. When the weather is sunny, we hop on our scooters and pick-up trucks and head to Khuk Kak Beach, about 2 KM from the camp. It is a quiet beach, near the Orchid Beach Resort and the Haven. Here are some photos of Khuk Kak beach. Memories beach is a favorite hangout for Rawai Muay Thai guests. This stunning beach is located about 15 minutes from the gym, down a winding dirt road that winds through rubber tree plantations. You can sip tropical fruit drinks and listen to reggae music while taking in the tropical view at Memories Bar and restaurant. Another popular thing to do here is surfing. The local instructors can teach you to ride in a day. You can sign up for classes and rent surf boards at their surf club. In the low season, around August or September, they hold surfing competitions. A little further North you get to Coconut beach. It is a quiet beach, seldom visited by tourists, making it the perfect place to enjoy your solitude. Bring a towel, a book and relax. There is a nice restaurant that offers Thai food at reasonable prices. To get a visual of this beach watch the video below that one of our students made about Coconut Beach. White Sand beach is next to Coconut Beach and is a favorite spot for our guests. There is a restaurant that serves Thai dishes. Also, there are huts were you can enjoy a relaxing Thai massage or just lay in the sun beds and look at the Andaman Sea. Even in high season this beach is not too busy. The same goes for most beaches in this area. Consequently it is one of the reasons people come to Khao Lak: to enjoy a quiet alternative to its famous neighbor to the South, Phuket.